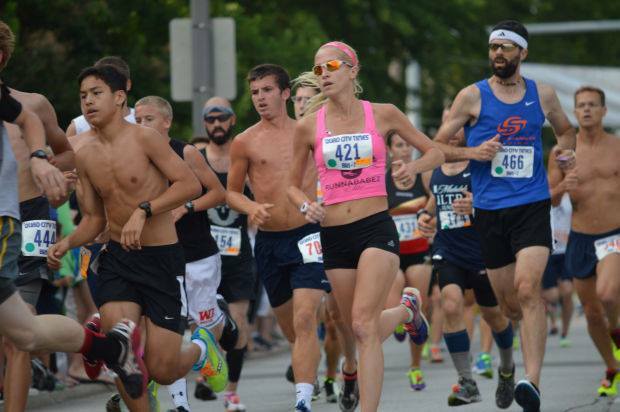 The Bix 7 is one of my favorite races, run off in Davenport Iowa. It is a classic race that features top runners from across the US, and draws in thousands of runners with the historic course that starts by running up a ginormous hill…I don’t know if they all come for the hill?! Maybe, but probably for the atmosphere, its circus like events afterwards,and the challenging course is what makes it the Bix and a race I didn’t want to miss this year. I have run it several other times and always love it. I have just started a marathon build-up and my legs are kind of dead dog like. I didn’t really focus on this as a goal race, and just decided to do it a few weeks ago. But, with it only being a 4 hr drive to get a chance to compete head to head with other ladies who are training towards the Olympic Trials, and this year it being the USA 7 mile Championship, I couldn’t not do it. I also wanted to see how I am progressing towards my goal of the 2016 Olympic Trials, and how I fared against the other runners who have been to the trials, Olympics, and are also training towards 2016. I drove down Friday after work, no stops, all business, to get straight to the expo to pick up my packet. I knew the timing would be tight since the expo was only open until 9. I wanted to get my number though the night before because there is around 20 thousand running, and wanted to be ready to go race morning not fighting through getting it at the last minute. As I was pulling into the expo, I casually see Joan Benoit Samuelson walking down the sidewalk, winner of the 1984 Olympics Marathon. I remember first meeting her here at the Bix three years ago, she beat me lol and told me nice race. The next year, I beat her lol. She is in her fifty’s and still qualified for the 2012 Olympic Trials! She is still the real deal! Anyway, I grabbed my number, and was in and out of that expo in 10 minutes, drove to hotel checked in, did a short shake out run, and grabbed some to-go sandwich at a restaurant right by my hotel, and got it all done in under 2 hrs to be in bed by 10:30pm. Race morning, I get to the course bright and early. I was kinda nervous, only due to the fact that one year I got trapped out of my right corral because of the gates, and then again had to hop it several years ago to get to my right spot. This year, I found the right elite entrance and was ready to go, no problem. I did my warm-up and all the elites , Molly Huddle, Amy Hastings, etc are all running around right by me. I used to think it was kind of crazy to be running with them or even be in some of the same races as them, like how on earth? Now, today was different. Today at the race, I was badgery as heck. I was confident, I believed that I deserved to race them. That I can run and compete against the best runners. Yes, Molly Huddle the American Record holder in the 5k, will still beat me, but that doesn’t mean I am not gonna give it hell and see how much I can improve and bridge the gap over the next years. I am training for the Olympic trials in 2016 and so are the other elites. There are others like myself who are stepping up to bat for the trials too, and lots of them were here. Perfect opportunity to see where I am at. While I was stretching, my old running pal Serena Burla (2:28 marathoner & previously placed 2nd at the USA Half Marathon) goes “LISA!” and gave me a hug. We used to run together when she lived in STL, now she is currently training & living in Virginia. Race time! We are all corralled into the starting line area, and I see another familiar face Amanda Bales Dunne. We did some of the same track meets back in 2012 while hunting trials goals. 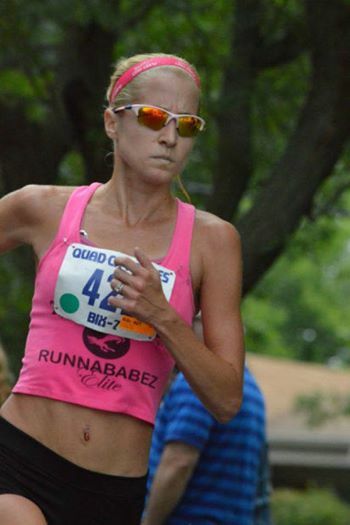 She ended up qualifying for the 5k and running in the Olympic Trials. We started talking, and lined up next to each other. After 20 minutes of pre-race speeches, anthem, guard brigades, and plane fly overs we were off! My plan was to take it easy up the massive hill to start, when I ran it before I didn’t. I was starting off conservative today because I didn’t know what my legs had in them with the start up of marathon training and figured it be best according to Coach to warm up into it. I hit the first mile, as planned, conservative, if a little slow at 6:2o. I was all around and surrounded by pack of men. I pushed my way through a little bit, had to elbow just a tad so this one guy would quit cutting me off. I hit the 2nd mile, too quick. Which oh well, I still felt good. The middle part of the race I rolled through the hills, and not normal hills, Babler Park like hills. I started to hurt pretty bad, around mile 4 in the hills and was feeling like I was slowing down. I wouldn’t have it today, I just had been to a book signing earlier in the week for Ironman, cancer fighter, Teri Griege. To say she inspires me , is an understatement. What she has achieved and done is amazing, fighting cancer, training for Ironmans, while going through chemo, helping others, by talking about cancer and taking screening precautions. I really felt a connection, for some reason, that we are like kindred spirits. I love her zest and personality. I thought of Teri & also Bill Rogers that wished me good luck, and told myself to dig deeper! SO I ratcheted it back up a level, and cruised through the next couple of miles. When I hit mile 6, I thought to myself, there was just 1 more mile to go. I hammered through it and ran rabid badger like all the way to the finish trying to catch this one girl. I just ran out of ground, but still finished with a new PR of 42:37, which was a minute faster than I have run that distance in. I raced hard, and dug deep that last mile to pump out a 5:33 or so. Immediately after I crossed the finish line, I kept on walking, and needed to pull over to the side and puke. LOL. Yep, I ran hard alright. I was happy with my results and that I ended up in 21st place overall in the USA 7 mile championships (original results had me 22nd, but was updated to show 21st). I closed the gap down on my competitors, and was surprised to see I was only 1 minute behind an Olympian 10k runner in 2012, Lisa Uhl. Serena placed 14th, Amanda was just ahead of me by 20 seconds or so, in 18th place, Joan Benoit Samuelson was 24th in 43:40. While I walked to my car, to head home I ran into Isaya, who is Serena’s coach. He is buddies with Tim and we all hung out before. He told me good job, asked me how my race went. I said I was happy with how I did and he asked how training and competing was going etc. He re-emphasized some training/racing things that sounded familiar ..that Tim has told me before lol. It is good to hear another coach that I respect say the same things though and say that he sees me achieving my goals. I have been very lucky in getting all these words of wisdom, and running into so many inspiring people lately. I feel like this dream of qualifying for the 2016 trials is now a goal, and do-able for sure after this race. I am lucky to have the Runnababez team mates, with Jackie already being to the trials, and training towards same goals. It’s so nice to have someone else pushing hard and trying for big things. As the saying goes, it’s not about the destination… it’s about the journey. Everyone’s journey is different. Everyone’s journey to a goal will be unique. I am enjoying my journey and the people in it: my hubby, my coach, family, my Runnababez, & my support crew!